Recognition of professional practice or specialty may come in many different ways. In 1980, the professional practice of infusion nursing was formally recognized when the United States House of Representatives declared January 25 as IV Nurse Day. This recognition was the beginning of what the infusion specialty has become. Specialization marks the advancement of nursing practice. It signifies that nursing has moved from a global approach to a focus on defined areas within the practice that require specialized knowledge and skills. 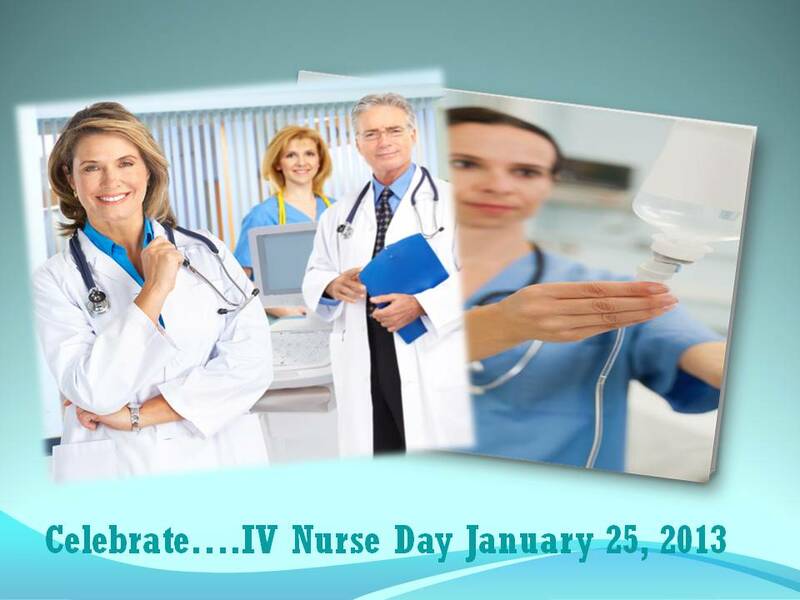 As we celebrate this day, I want to wish each infusion nurse Happy IV Nurse Day. Whatever you do and wherever you are, on this special day, take the time to celebrate the numerous accomplishments that make us proud to be infusion nurses. Reblogged this on Musings from a "VEIN" nurse . I am having a hard time finding any info on the intradermal injection of bacteriostatic saline to numb the port a cath before accessing. I have a newly hired nurse who wants to adopt this procedure for our op chemo suite and others have concerns re: infection etc. We do offer emla cream by rx. We have tried this and most of the patients like it, I just need to find some other documentation on this procedure. Thanks for your comment. The use of bacteriostatic saline for numbing the skin prior to IV insertion is a common practice. A while back when implanted ports were new, we used buffered lidocaine or bacteriostatic saline (for those with sensitivity to lidocaine) intradermally to numb the skin until the topical/transdermal anesthetic creams came along. With the intradermal injections, many patients complained of burning and stinging and did not like the discomfort of the needle stick. Now for port access placement, the common practice is the use a topical/transdermal anesthetic cream. Not to say that the concept of using bacteriostatic saline to numb the skin prior to port access placement is not feasible, but perhaps just not a common practice hence the difficulty in locating published articles. Cora, thank you so much for such a prompt reply. Some of our staff had concerns that creating 2 (one from the intradermal, and one from the pac needle) injections sites on top of the port may be problematic with our oncology patients & infection as most are immunecompromised. Thankfully we have a very low pac infection rate, and hope to keep it that way. I find this site so helpful, and will pass this on to my staff.